Description: James E. Richmond Science Center previews a full dome show every 1ST & 3RD Saturday. Exploration Stations» 6:00 p.m. – 7:45 p.m.
Fulldome Shows» 9:30 a.m. | 10:45 a.m. | 12:00 p.m.
Exploration Stations» 9:00 a.m. – 12:45 p.m. Directions: Enter Greenwell State Park on Rosedale Manor Drive, go straight on the gravel, dirt road, between the fields, and take your first right. Park in the lot straight ahead and look for us in the outdoor classroom on the left. Details: Meet at the Shop at Farthing's Ordinary to join the Little Explorers as we sit in the sun and walk down to the water. Parents - we are not planning on wading in. Instead, will soak up the sun and enjoy the day! Little Explorers discover the world at Historic St. Mary’s City through storytelling, crafts, songs, and outdoor exploration. Preschoolers, ages 3-5, and an accompanying adult are invited to gather at Historic St. Mary’s City for an hour of adventure, fun, and learning twice monthly on Wednesdays in the spring and fall. Each Little Explorers gathering features a different theme. The program runs from 10 a.m. until 11 a.m. Admission is $4 per child for non-members ($3 for Friends members) and accompanying adults visit free. The fee includes full-day admission to the museum. Bring a picnic and spend the day! For more information, contact Sharol at 240-895-4980 or email Programs@HSMCdigsHistory.org. Details: Join us as the U.S. Botanic Garden celebrates Earth Day! Come enjoy engaging hands-on activities and meet with representatives of environmental organizations from throughout the region. Learn about the ways you can make the planet a healthier place and become a more active steward of the plants that support life on earth. Time: 9:00 a.m. – 1:00 p.m. Details: Our 2019 STEM-ING event will again offer Southern Maryland girls a chance to participate in wide variety of hands-on workshops focused on STEM topics, as well as interact with women that have successful STEM careers. The event is a lot of fun each year! Registration info will come as the event gets closer. 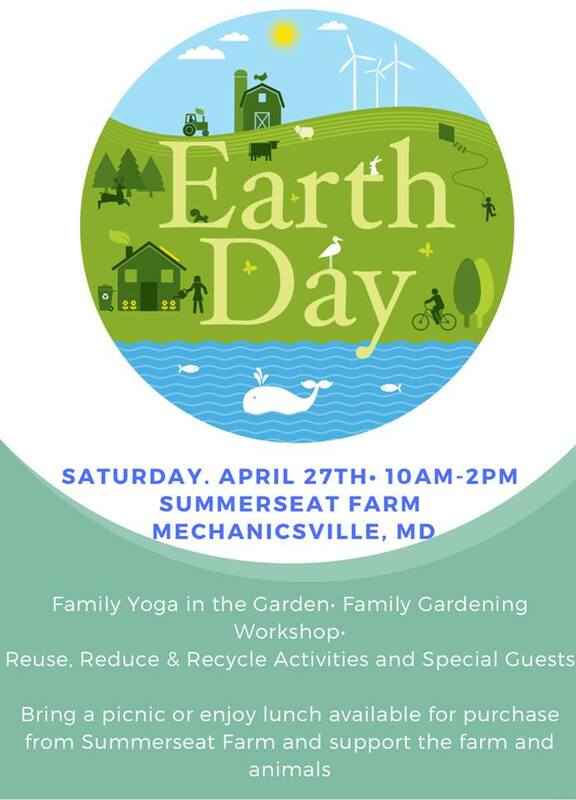 Family Yoga in the Garden, master gardeners for family gardening workshop and so much more! Details: Explore the natural wonders of Piscataway Park with a guided trail walk led by an educator. Identify plants and animal life, learn about wild edible plants, or explore the changes in the Potomac River Landscape since the colonial period. Departs from Visitor Center at 1 pm and 3 pm.